InfantBows: New name for InfantBow Glue! New name for InfantBow Glue! The time has come to make up my mind on the new name of InfantBow Glue. I love that this name says exactly what the product does, but many moms have expressed concern about putting "Glue" on their new little baby. 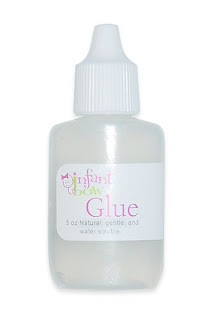 InfantBow glue is 100% natural and made from organic sugar. I would love a name that expresses how safe and natural this product really is. I would also like it to express the tremendous holding power it creates. Infantbow glue actually dries and creates a bow that stays on. This is unlike surgical gel that stays sticky and slimy. I would love your feedback and ideas on this. I am also working on a new gift set design so stay tuned! !